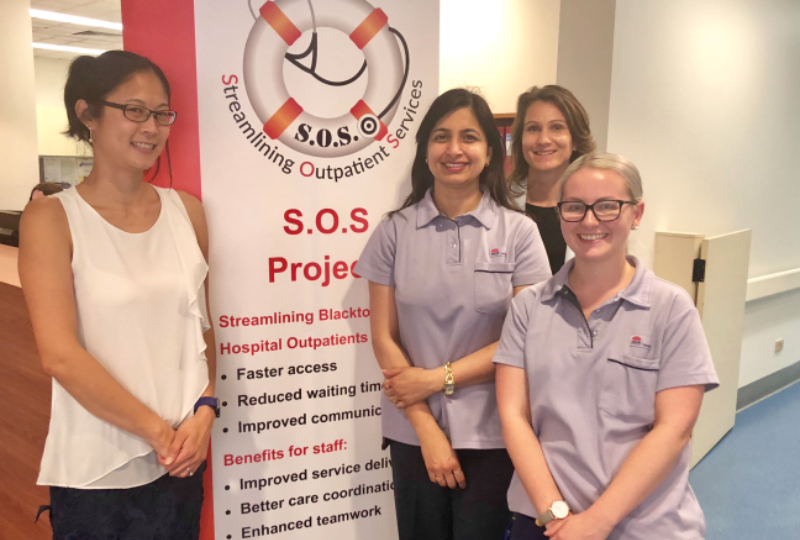 A new project at Blacktown Hospital will improve patients’ experience in outpatient clinics by reducing waiting times, improving communication, updating booking and attendance procedures, and streamlining and standardising clinic processes. Called S.O.S, for Streamlining Outpatient Services, the project will initially focus on the Infectious Diseases Clinic with plans for a phased roll-out to other outpatient clinics in the future. “Since 2014, there has been a 66% increase in outpatient activity, and that will continue to increase as Blacktown expands to become a major teaching hospital for Western Sydney,” said Project Sponsor, Leanne Watson. Once the main clinical departments relocate in mid-2019, large parts of Building B will be refurbished to create more capacity for the outpatient clinics. The S.O.S project is starting the transition now so that issues can be identified and solutions implemented early. “Our aim is to have changes to systems and procedures in place so that by the time the expansion is completed, it’s just business-as-usual,” Leanne said. Ensuring patients have a positive experience in clinics which supports their recovery. The project team recently presented to nursing, medical and allied health outpatient leaders last month and will now be working with staff, patients and carers to identify issues and barriers.